The current article continues the series describing indicators and setups that generate trading signals. This time, we will have a look at the pivots — reversal levels (points). We will apply the Standard Library again. First, we will consider the reversal level indicator, develop a basic strategy based on it and finally search for the means to improve it. It is assumed that the reader is familiar with the CExpertSignal base class for developing trading signal generators. For this strategy, we will use the indicator plotting potential reversal levels. Plotting is performed by means of graphical construction only. No graphical objects are applied. 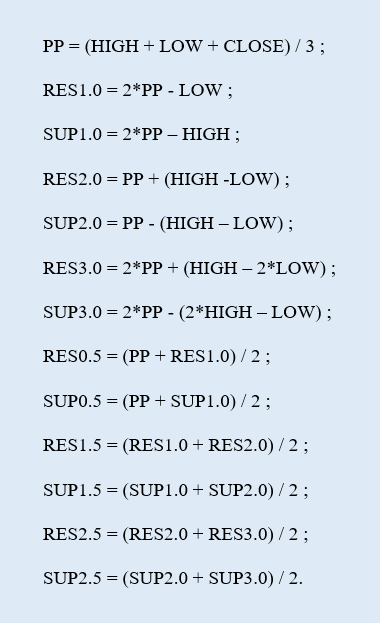 The main advantage of this approach is the ability to refer to the indicator in the optimization mode. On the other hand, graphical constructions cannot exceed the indicator buffers meaning there will be no lines in the future. Levels can be counted in several different ways. Further information on this subject is available in the article "Trading strategy based on pivot points analysis". Last edited by CollinPalmer; 07-16-2017, 06:17 PM.